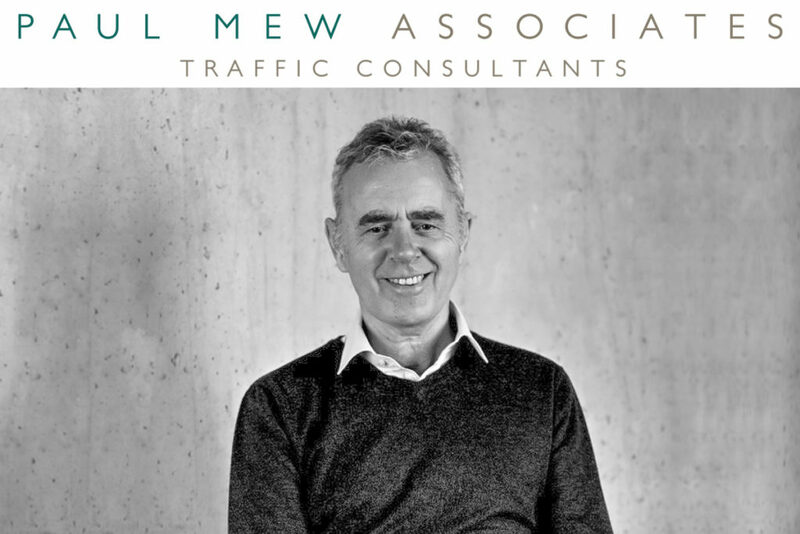 Paul Mew has been working as a traffic consultant since the 70s and is now Director at Paul Mew Associates. We rely on Paul and his team to keep site logistics running smoothly so that our developments don’t hit any speed bumps on their way to becoming dream homes. Construction projects are enormous logistical undertakings. Without a plan in place for how people, materials and spoil will make their way to and from a building site, even a modest residential development can collapse under its own complexity. Traffic Management Consultants such as myself use a mix of regulatory knowledge, advanced software and logistical experience to draw up detailed plans that prevent construction projects from hitting red lights. Most residential sites are inevitably located in residential areas, which, in London, means narrow streets often lined with vehicles on either side. A project, not to mention the local traffic, would grind to a halt if a lorry delivering supplies found itself stuck on its way to the site. To prevent such a situation, traffic consultants such as us produce a Construction Logistics Plan (CLP) as part of the Construction Management Statement (CMS). CLPs are required by London boroughs before a project can receive planning approval, though they can continue to be updated as needed throughout the project’s lifetime. The CLP submitted as part of the planning documents outlines the logistic issues expected during a development, and how the developer intends to solve or mitigate them. More than just detailing how vehicles will go to and from the site, a CLP also needs to demonstrate measures that will be taken to limit the impact of local community and infrastructure, neighbour amenity and the amount of pollution, vibration, noise and dust produced by vehicles. Much of the CLP is modelled using various mapping software to calculate the ideal routes to avoid public transport lanes, schools and congested roads. We also use this software to determine what type of vehicles will be able to navigate these routes and how many trips will be required to deliver and remove the estimated volume of materials and spoil. A school in the area is a particularly difficult challenge, as we face tight restrictions on when vehicles are permitted to pass nearby, limiting transport hours to 9:30 to 15:00. We try to avoid schools as much as possible, but as many family homes are built in close proximity to schools, working within their restrictions is often unavoidable. We also use TfL data to advise on public transport routes for contractors to take to the site to avoid further congestion being caused by each contractor showing up with their own car. This map is used to determine whether the vehicles required for the development (in this case a skip, truck and concrete mixer) will be able to access the site and how close they will be able to park to it. Both during the planning stage and throughout the duration of the project, we need to work closely with the architects and contractors to have an accurate supply of data and to be able to provide them with plans that will have a significant impact on how a development is carried out. For example, it may be impossible for a typical 8 metre spoil removal lorry to access the site, in which case the contractors will either have to use smaller vehicles more frequently, or deliver the rubble and mud by wheelbarrow to a location where the lorry can park. It’s also not unusual for concrete mixers to be too large to access a residential area, requiring concrete to be mixed on site instead, which slows down the amount of concrete that can be produced in one day and – by extension – pushes out the delivery time of the project. In one recent project that we produced a CLP for, the house sat at the end of a narrow, quiet road with an almost 90 degree bend. After testing numerous different logistics options, we determined the only feasible solution was to use the smallest vehicle possible: a 3.5 ton Nissan Cabstar, the only truck narrow enough to squeeze its way to this difficult site. There are cost implications of having to use such a small vehicle, as more trips are more expensive, but the council wouldn’t have allowed it any other way. Had we not been involved, the contractor may have proceeded with a larger, more convenient vehicle, only for the council to take enforcement action against them. 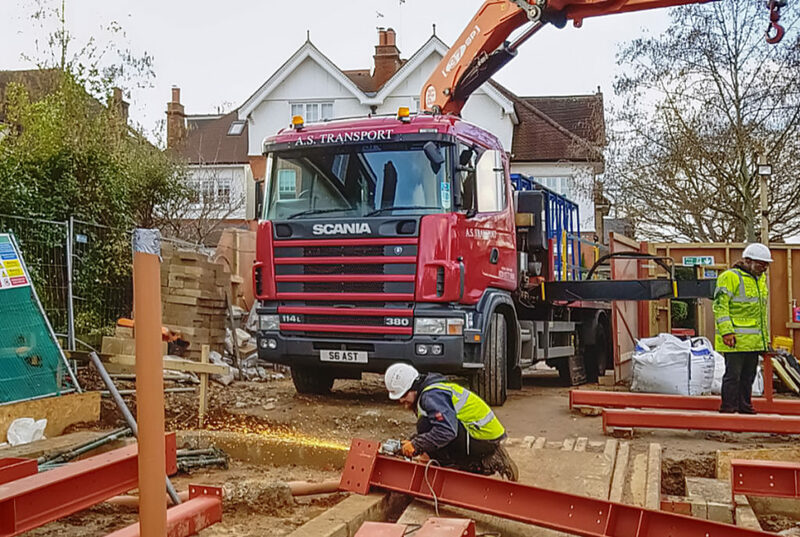 At Denbigh Gardens, we couldn’t fit a full size crane on site, but we were able to bring in this lorry-mounted crane to move the massive steel beams. If you would like to know more about the work that we do at Paul Mew Associates and how it can help you build your dream home, please get in touch with us at paul.mew@pma-traffic.co.uk or 020 8780 0426. 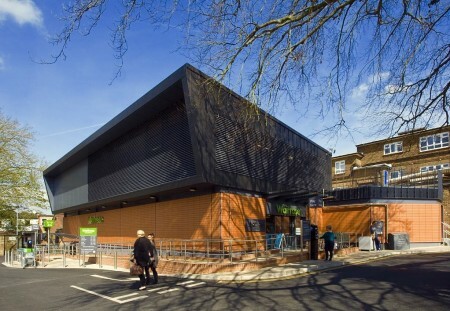 Conversion and extension of former shopping parade to provide a new Waitrose food store. The rear of the site former comprised of a Council run car park and lock-up garages, such as part of the development, parking reallocation was carried out to provide new car parks for the Council and Waitrose. Extensive work was carried out on servicing of the site by means of time controlled access to Leatherhead’s pedestrianised high street. The new Waitrose food store opened for business in Janary 2017. 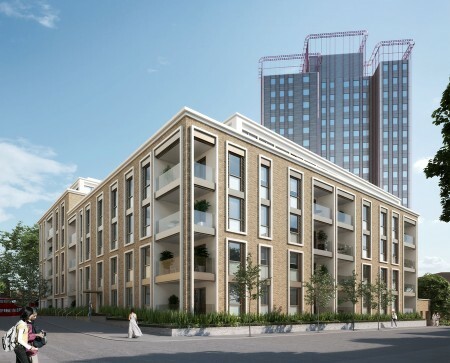 Paul Mew Associates supports a successful planning application for the redevelopment of 194-196 Cricklewood Broadway to provide a new ASDA supermarket with a basement car park plus 96 residential dwellings with additional parking provided in an adjacent parking deck. The application was supported by a comprehensive Transport Assessment which included a TRANSYT junction impact assessment of the A5 Cricklewood Broadway junction with Depot Approach and the adjoining A5 Cricklewood Broadway junction with Cricklewood Lane and Chichele Road, as well as separate Workplace and Residential Travel Plans. Barnet Council planning reference 17/0233/FUL. 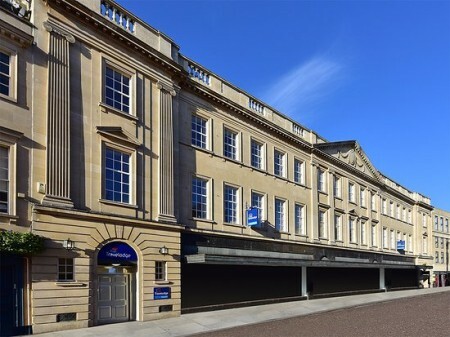 Conversion of former office accommodation in the centre of Bath to provide a new Travelodge hotel. Issues addressed as part of the work carried out by Paul Mew Associates included assessment of parking provision for hotel guests as well as devising a servicing management strategy at this key city centre location. The new hotel opened in Autumn 2017. Paul Mew Associates supports a successful planning application for the demolition of part of the western section of the site and the construction of a new four-storey building providing a new visitor centre, box office, and retail space. We prepared a Transport Assessment, a Construction Logistics Plan, a Delivery Service Plan, and a Travel Plan for submission with the planning application. Southwark Council planning reference 16/AP/3009. 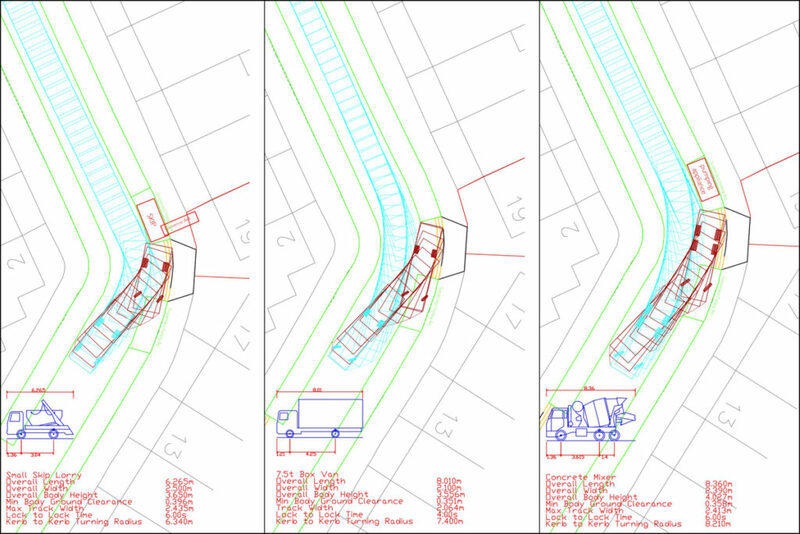 Paul Mew Associates prepares supporting parking, access, and servicing information for submission with a successful planning application for the conversion of 38 sheltered flats into 18 general needs dwellings. Hounslow Council planning reference P/2017/1637. Paul Mew Associates was instructed by Basildon Council to assist with plans for the redevelopment of 36 lock-up garages to provide three new terrace houses with associated access and parking. A robust parking assessment inclusive of a parking survey was carried out to assess the potential impact of the loss of the garages. 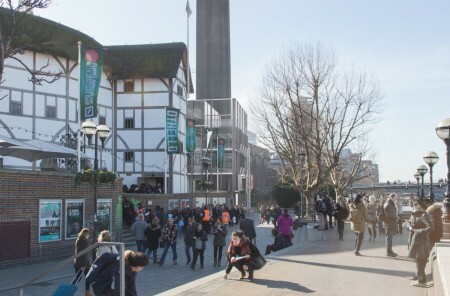 The plans were granted permission in May 2017. Basildon Council planning reference 17/00664/FUL. Paul Mew Associates supports a successful planning application for the proposed expansion at Sittingbourne Community College. The development will incorporate new classrooms, revisions to the internal access and parking layouts, together with a brand new site access from the A2 Canterbury Road to serve access to a new coach and taxi drop-off/pick-up area. We prepared a Transport Assessment and facilitated a Stage 1 Road Safety Audit as part of the planning submission. Kent County Council planning reference KCC/SW/0095/2016. Paul Mew Associates prepared a Transport Statement and a Framework Travel Plan for the creation of eight new classrooms at the Sandy Hill Academy, St Austell, Cornwall. The proposals were granted planning permission in September 2016, Cornwall County Council planning reference PA16/07657. The development at the Sandy Hill Academy is one of a large number of schools included in the Cornwall Schools Basic Needs Programme 2015-2017 which we have worked on in partnership with Mace and Bailey Partnership.